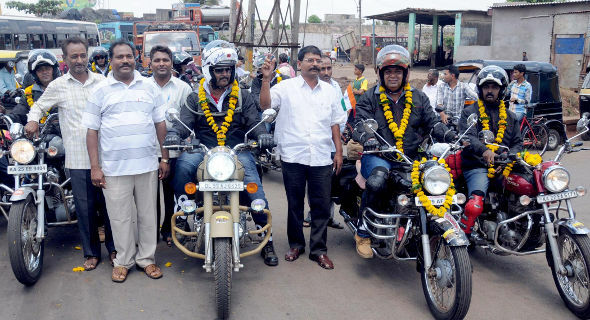 Motorcyclists from Hubli’s ‘99 Cannons Motorcycle Club’ reached Belgaum this morning who are enroute an expedition from Kanyakumari to Khardung-La in Kashmir to create awareness on women’s empowerment and crimes against women. The team will cover a distance of 5,999 kilometres during their 25-day expedition. The team would be accompanied by a doctor, a mechanic and a photographer. From Khardung-La, which they will reach on June 6, the motorcyclists will proceed to Amritsar and participate in an awareness programme.